SADIE & JACK — Five-year-old Sadie, a corgi-bue heeler mix, rarely leaves the side of her owner, Jack Miller, who was never more appreciative of that than on a spring day last May. Not all heroes are tall and strong. Some are short and stocky and like to stick their head out of the window of a moving vehicle. Introducing Sadie, a 5-year-old, 45-pound corgi-blue heeler mix, who on a spring day back in May 2018 came to Jack Miller’s rescue without thinking twice. Miller is best known in Tracy as “Jack the Barber,” as he owned and operated his downtown barber shop for nearly 50 years. 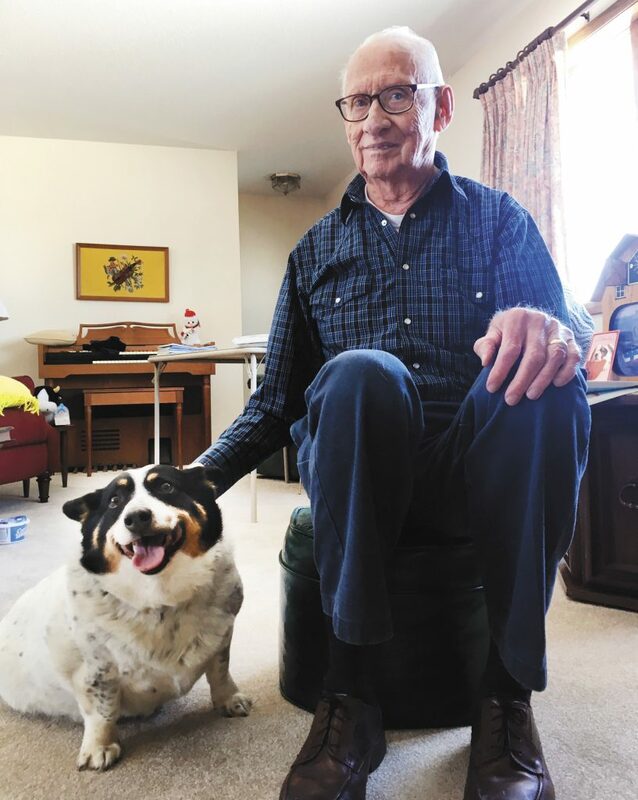 Now a small-scale livestock farmer at his homestead a few miles east of Tracy, Miller learned just how much his Sadie means to him during what started as a typical day on the farm. He and Arlen Thomas were working to trailer a 600-pound bull calf when things went terribly wrong. The bull calf ran over Miller four times, but for some reason never stepped on him. “He just kept going back and forth,” he said. The 84-year-old Miller, down and in pain, was virtually helpless. But he eventually got help from his four-legged companion whose belly almost touches the ground when she walks. Sadie — hardly ferocious looking at first glance — sprung into action and penned the beast, holding it there by biting at it. For her efforts, Sadie is being called a hero by the Minnesota Veterinarian Medical Association, which will honor the dog and her owner at the MVMA’s 12th Annual Meeting in Minneapolis on February 9. The MVMA grants awards annually to outstanding animals in three different categories: hero (animals who have saved a life), companion (animals who have provided benefit to their human companions) and professional (animals specially trained to assists humans). MVMA Executive Director Dan Tjornehoj said submissions for awards come from the group’s 2,000 member veterinarians. “This is a way for us and veterinarians that care for animals to identify a special animal they’ve cared for,” Tjornehoj said. Sadie was nominated by Dr. Kathy Brockway. She and her husband, Bill, will bring Miller and Sadie to the MVMA luncheon. See this week’s Headlight-Herald, for more on this article.